It'd be my observation that if you're an active music fan/consumer and you rely on the mass media for information on current goings on in contemporary music such as new releases you're likely being exposed to a a fairly narrow range of info. If you monitor national print publications devoted to music (an easy task as that's now just a handful) and the most prominent online outlets you'll note that the same acts are getting covered across the board. And that's for a number of reasons (including the impact of folks in my particular line of work) that include, occasionally, the overwhelming creativity, technique (or ability to transcend considerations of conventional skills), power to excite, inspire and connect with listeners; but quite often, it's down to expert and well funded marketing. And music, finally, is a pleasure -- and if what you're exposing yourself to is pleasant to you -- all well and good. 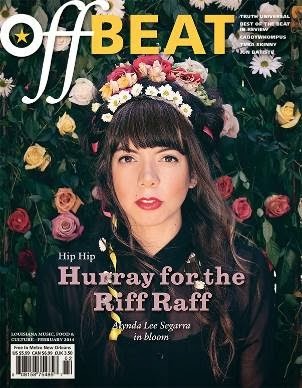 A couple years ago, I started subscribing to Offbeat, which is a monthly music magazine published in New Orleans. It's printed on slick paper, full color. About the length of Entertainment Weekly. This was a part of my efforts ala Huysmans' "A Rebours," to recreate a bit of the ambience and spirit of that city in my current hometown of Morrisville, PA. (please see my FB page for pix of the Mardi Gras beads festooning the front porch railing and Carnival tree set up in a back room). Yes, it's a silly affectation - but no sillier that furnishing your house in expensive, neo-Colonial or mid-Century antiques 'cause in the end that's just stuff you sit or lay on or stash stuff in - and it's pleasures me. Whatever. Back to Offbeat -- on reading it month after month, then year after year, what emerges as most striking is that it is devoted primarily to local artists - all the cover stories, most of the inside features and the grand bulk of the record reviews (and the reviews section rivals Rolling Stone's in the number of releases covered). More than enough to warrant there being a monthly magazine devoted to covering. Stop and ponder that for a second - a regularly published music magazine that doesn't cover much if any nationally popular music and still finds plenty to fill its pages. Practically NONE of these ever show up in national coverage and a fair amount are vital, entertaining, enlivening listening experiences, many of them bearing little or no relationship to anything you've likely been exposed to watching the Grammy's or other TV awards shows, reading national media, listening to the radio etc. One is thus confronted with the possibility of having an active, ongoing relationship with a delightful and in fact stylistically diverse body of contemporary music that is largely uncurated, unfiltered and unfettered by the many aesthetic/economic constraints that fence in the arenas of "pop," and mainstream "alternative" music (nothing against Miss Lorde but how she's the "alternative" to anything other than Rihanna etc. is obscure to me). Of course, while the New Orleans music scene is especially large and diverse and notable for been extraordinarily supportive of its own (outside of the skirmishes between bourgeoise homesteader and folks looking to preserve and expand on the city's LONG tradition for street music and widespread live music in clubs), the same sort of thing happens around the country -- almost entirely under the radar of media "tastemakers," and "trendsetters" (read "power brokers"). If you're a fan of current pop trends - bless ya! Whatever brings some innocent joy into your heart is a good thing, finally. But if you find yourself dissatisfied (maybe you're addicted to novelty and exotica like me perhaps) - there's a WEALTH of amazing music out there waiting for your discovery. To paraphrase Dr. Leary: "Power down, Unplug, Move On." Trust your ears and your heart.